I posted this at GzN since a lot of people had no idea about reversing so hopefully this well help them start out and maybe it’ll help some of you guys too. This article will cover most of what you need to know to get started in reverse engineering. I will assume you know pretty much nothing so if you see a bit you already know heaps about, just go onto the next bit. I have posted my crap over here as well because this is 1 more forum that I recognise as a place where people want to learn. Somewhere where the attitude isn’t just leech to get the hack working but find out how to make your own hack and why the hack works. As I always say Hack to learn, don’t learn to hack. You may or may not know that a computer stores data as 0s and 1s. At a hardware level, a 0 is represented by a low voltage and a 1 represented by a higher voltage. Now then, in our normal system, we can have numbers ranging from 0-9. A computer only understands 0-1. In a binary number system, we will have many of these 0s or 1s. Each one of these numbers is known as a bit. 8 of these bits put together is called a byte. The number system that you use in everyday life is called the decimal system. Some of you may notice that decimal means that there are 10 (dec in latin is 10) possible combinations for each digit. This is clear since we can have 0, 1, 2, 3, 4, 5, 6, 7, 8, 9. In the binary system we are only allowed 2 combinations for each digit, 0 and 1. Now then imagine when you’re counting up in 10, you go from 0 to 9 until 10. After 9, you know that there is nothing next so you put 1 onto the column next to it and reset the column that contained the 9. In binary, it is exactly the same. You start with a 0, go to a 1. You can now see that we can no longer represent further combinations with 1 bit so the next value would be 10. Now how do we convert binary to decimal ? Okay, first of all, let’s look again at a decimal number: 842. The binary system is exactly the same except our base is not 10, but rather 2. Let’s look at the number : 10011110. Word	–	A word is 16 bits, or 2 bytes. Therefore we have 2^16 – 1 different combinations, that is 65535. Double word – A double word (also known as a dword) is 32 bits, 2 words or 4 bytes. Therefore we have 2^32 – 1 different possible combinations, that is 4294967295. Kilobyte	–	A measurement you might be a little more familiar with. A kilobyte represents 1024 bytes. Megabyte	–	A megabyte represents 1024 kilobytes and therefore 1024*1024 bytes, that is 1048578 bytes. Let me now introduce you to the hexadecimal system. In the hexadecimal number system, we have 16 different combinations for 1 digit: 0, 1, 2, 3, 4, 5, 6, 7, 8, 9, A, B, C, D, E, F.
This section will consist of a gross oversimplification of the 80×86 CPU family and information on 32 bit 80×86 processor registers. Before I get into describing assembly language instructions, I will explain to you a little about the CPU, memory and a little about I/O (input/output) devices. These three components are connected by the system bus. Out of these, I will go into more detail on CPU registers and the memory stack. Within your CPU there are a number of processor registers. These small amounts of storage can be accessed faster than storage anywhere else. Almost all calculations on the 80×86 CPU involve a register. Registers will generally act as a middleman in a calculation. You may have heard talk of 32 bit and 64 bit processors. Possibly you never understood exactly what that meant but one of the main differences is the range of addresses the processor is able to address to. A 32 bit processor can address to 2^32 different addresses. In hexadecimal, this is 00000000-FFFFFFFF. On the other hand, a 64 bit processor can address to 2^64 different addresses. In hexadecimal, this is 0000000000000000-FFFFFFFFFFFFFFFF. Yep, that’s 16 Fs instead of 8. Notice it is not double the amount as is so commonly thought but actually a 64 bit processor could actually address to the polynomial order 2 as many addresses as the 32 bit processor (ie. if you take the different number of combinations available for a 32 bit processor as x, the 64 bit processor can address to x^2). Adding to this (since it isn’t strictly 100% correct), the “size” of your processor is either the minimum number of data lines on your CPU or the largest general purpose integer register. For example, all modern x86 processors have 64 bit buses (they can move 64 bits of data in one memory operation) but their largest general purpose integer register is only 32 bits. Therefore this type of processor would be classified as 32 bit. (I was previously a little mixed up between the address bus and the data bus ). That was merely some background information to let you know what I mean by a 32 bit processor. Actually I want to show you what the registers are, how they are used and how you will use them in reverse engineering. Although each register has a purpose, a lot of the time you can use them for whatever you like. However you must always follow this rule. If you are to use a register, you must make sure that after you finish using it, it ends up with the value it was holding before you used it. One particular register from the above I would like to point out is EIP. This register holds the address to the next instruction the processor will execute. In fact in one of the parts of my reversing series, I will demonstrate how this register’s value can be manipulated to control the flow of the code execution. The 32 bit registers described above can hold 32 bits of data (4 bytes/a dword). EBP and ESP are related to the memory stack which I will be explaining a little about later but it’s nothing you have to worry about yet. Now, as well as having 32 bit registers, we have 16 and 8 bit registers too. Note that the 16 and 8 bit registers are NOT separate from the 32 bit registers. I don’t know how I can emphasise this more but it is essential that you understand this. The registers are not separate. The 80×86 overlayers 32 bit registers with 16 bit registers with 8 bit registers. The lower parts of EAX, EBX, ECX and EDX are called AX, BX, CX and DX respectively. 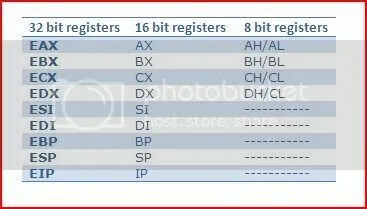 AX, BX, CX and DX are 16 bit registers meaning they can hold 16 bits of data (2 bytes/a word). Now these four 16 bit registers are also split into higher and lower parts. The higher parts are called AH, BH, CH and DH. The lower parts, AL, BL, CL and DL. The four 32 bit registers described above are called general purpose registers. To better consolidate your memory I will give an example of how the registers interact with each other. All good ? Understanding of this is critical to reverse engineering otherwise you’ll never know how certain values got to be where they are. However I have missed out one very special register till the end. This is the EFLAGS register. It is a 32 bit register holding single-bit boolean values. Boolean means the state of the value is either true or false. Did you ever wonder what happens when a processor is executing instructions ? Most of the time, code execution does not just go down vertically but jumps around. How do we control where we jump to ? 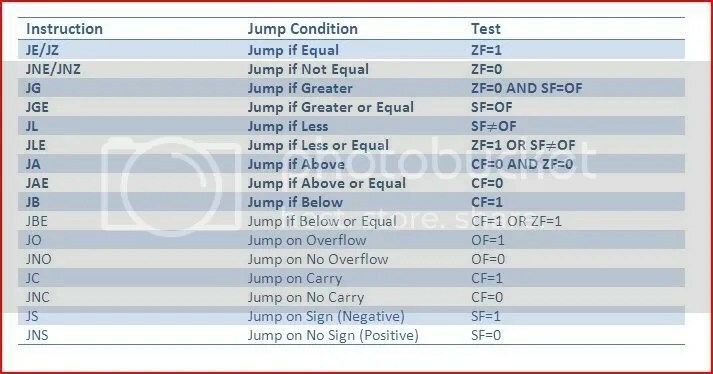 Well we use conditional jumps. This is the equivalent of a higher levelled syntax such as IF. It eventually results down to a bunch of conditional jumps. Z-Flag – The zero flag is set or cleared depending upon the result of the prior instruction. If the result of the prior instruction was 0, then the Z-flag is set (1), otherwise the flag stays clear (0). O-Flag – The overflow flag is set when the prior instruction resulted in the register operated on to undergo a change in its highest bit. C-Flag	–	The carry flag is set if you add a register’s value exceeds FFFFFFFF or is less than 0. And that’s all you will need to know about registers and flags to being reversing. The memory stack is a part in your computers memory you can use to temporarily store data. This data could be an address, a constant, etc. Think of the stack as a massive box that is available for you to stack pieces of paper. When you put something onto the stack, it is called a push. When you remove something from the stack, it is called a pop. Now let’s pretend you really had a stack and you wanted to put things onto this stack. Well if I had just piled up 10 pieces of paper on top of each other in my stack and I wanted to remove the one at the bottom, I can’t just pull it out. Instead I would have to remove every other piece on top of it first before being able to get at the piece at the bottom. This is the most important rule about stacks. The first thing to be pushed onto the stack is the last to come off. In practice, there are a few exceptions to this but I won’t go into detail. This also goes for the other way round too. Whatever you last put onto the stack is the next thing you take off unless you put something else on. What is the assembly language ? As a reverser you will be seeing the most of assembly language. In general, you will be examining the disassembly of an application. This means looking at direct instructions that the processor is following. At the end of the day all computer languages are translated down to assembler. Most instructions in the assembly language have an operation code followed by two operands. However there can be more or less operands depending on the operation code used. Operation code is also known as opcode. These are similar to the syntaxes you may use in other programming languages except that these are direct instructions to your processor. These instructions are also known as mnemonics. Bear in mind that mnemonics are just easier words that you can remember. They are actually translated from bytes that a processor reads. All values in the assembly language’s mnemonics are always hexadecimal. MOV – This is the move instruction. It will take two operands and operate on them. You may think of it as copying instead of moving since the operand copied from does not lose its value. The operands that are available are registers, addresses or values. When there are square brackets such as [X], then it means the contents of X.
CMP	–	Compares the two operands and sets C/O/Z flag accordingly. INC	–	Increments the value. DEC	–	Decrements the value. ADD	–	Adds two operands. The result is stored in the destination address/register. SUB	–	Subtracts the source from the destination and stores the result in the destination address/register. [b]CALL – Pushes a RVA (Relative Virtual Address) of an instruction onto the memory stack and calls a sub program/procedure/function. DIV – DIV divides EAX by a divisor. The dividend is EAX as is the where the result is stored. The modulo-value is stored in EDX, ie. the remainder. EAX would end up holding 4 and EDX, 1 because 9-(4*2). IDIV – The same as DIV except it can handle signed numbers. A signed number means it can be positive or negative. The I is an abbreviation for integer (division). MUL – Multiplies either EAX with a value or multiplies two values and puts them into a destination register or it multiplies a register with a value. IMUL	–	Integer multiplication, the same as MUL except you can use signed numbers. INT	–	Calls an interrupt handler. The value called must be an integer. LEA	–	Load effective address. Usually used for doing calculations for addresses quickly. Would give EAX the value of 2*EBX-ECX. NOP	–	No operation. Does nothing, literally We often use this to overwrite calls, etc. so that instead of that call or instruction, nothing will happen. RET	–	Returns after a CALL instruction. The return digit cleans the stack before returning. TEST – Performs the logical AND instruction on two operands and results are used to set or clear Z-flag (more on bitwise operators later). Overflow and carry flags are also cleared with this instruction. The last two instructions of interest are PUSH and POP but we’ve already covered those to a certain extent. Just remember with the stack the first in, last out rule. I mentioned signed numbers with IDIV and IMUL. You may be wondering how a binary system can represent negative and positive numbers. One way is to use one of the bits to state whether the number will be positive or negative. Therefore although the range of numbers stays the same, the numbers available are not. For example, in a 8 bit register, there can be 256 different combinations. However the range of the numbers is actually -128-0 and 0-127. The AND operation will result in a 1 only if both corresponding bits are one (ie. the first one and the second one). Everything else will result in a 0. The OR operation will result in a 1 if either bit has a one (ie. the first one or the second one). Therefore only if the two bits to be operated are zero will the result be a zero. The XOR operation will result in a 1 only if one of the bits has a one. XOR means exclusive OR which means either one but not both. The NOT operation will result in a 1 if the bit is a 0 and will become a 0 if it is a 1. First of all, I would have use an ASCII table to convert each character into a hexadecimal value. Notice that the last four characters aren’t normal writable ones. I used a bad example in this case but you get the idea hopefully. In practice, we wouldn’t go doing this by hand. There are many programs to do this or in fact Windows calculator contains a hex<–>dec<–>bin converter that you may use as well as several common bitwise operations. As always if there is anything you do not understand, feel free to ask and I’ll explain to the best of my ability. Just download and extract to a folder and show Olly the path in Help >> Select API Help File and select win32.hlp. That’s all, you should be able to start playing around with Olly and understand vaguely what is happening. As always if you have any questions at all, don’t hesitate to ask. I love it Man , keep up the good work !!! !